At 7 years old, local resident Cole Piotrowski asked his parents if he could learn to ride a horse. 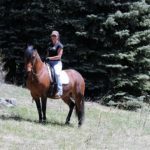 After searching the internet, they found Fiona Laing at Skye Stables in Evergreen. 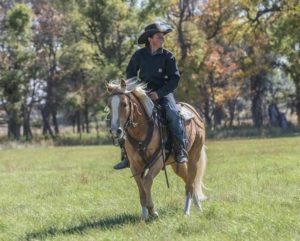 An accomplished horsewoman and a student of well-known trainer Chris Cox and his methods. Cole began learning the fundamentals through weekly lessons on Fiona’s black and white paint, Ace. Knowing that horses are much more than just riding, Fiona taught and exposed Cole to all aspects of horse ownership. The spark of interest Cole had in horses soon turned into a full-blown fire and he was asking to do any chores that needed to be done at Skye Stables including feeding, cleaning stalls and unloading semi loads of hay in order to be immersed in this new life he found. Cole continued to become a better rider and horseman. Fiona has a gift of looking past her students fears and worries and challenges them to become better partners with their horses. Cole’s confidence continued to grow and his family decided it was time for Cole to have a horse of his own. Fiona helped Cole’s parents find a 5 year old gray gelding named Blu and they gave him to Cole for his 10th birthday. From the beginning, Cole was drawn to all things “cowboy”. He didn’t miss the Evergreen Rodeo or National Western Stock Show. He couldn’t watch the ropers and riders enough as he carefully studied their every more. 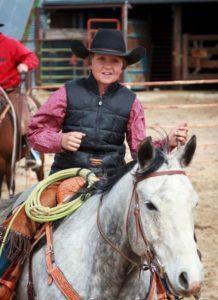 When Cole was 12, he had the opportunity to attend a roping clinic with Krece Harris. Krece took him way out of his comfort zone by having him ride new horses and team rope steers. Krece told him that roping is “80% horsemanship and 20% roping skill” and because Cole had put so much work into his horsemanship and so much ground work into practicing roping, he would be an excellent team roper! The clinic with Krece was a defining moment for Cole and his dedication and focus intensified. Around the same time, Cole started Ranch Sorting with ERSA (Evergreen Ranch Sorting Association) in Pine. 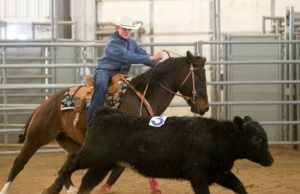 Cole quickly picked up the skills necessary to move the cattle between pens in this competitive and timed sport. However, Blu was not quite as interested in Ranch Sorting. Blu was a steady, strong, and reliable partner when Cole visited the working ranches of friends. He would drag calves to the fire for branding, go on long drives, and work his heart out all day for his boy. But Blu did not possess the athleticism needed in the sorting ring. 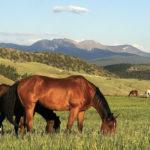 Cole had a strong interest in ranch sorting, but needed to find the right horse for the sport. His family decided to contact Chris Cox, to see if they could find the right horse through someone they trusted. 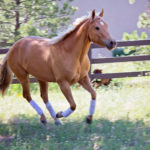 While Chris does not usually sell horses as part of his training business, he invited Cole to Texas to try out several horses that might be a good fit for him. Cole immediately took to a 4-year-old bay gelding named Scooter and they have been an amazing team in the sorting pen ever since. 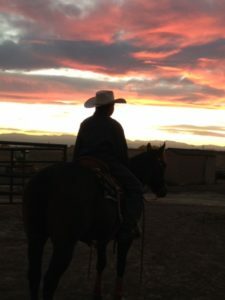 Cole and Scooter have competed in the Colorado state finals 3 times; finishing his first year as the Youth champion, second year 3rd in the Rookie Division and in December 2016 they finished 3rd in Colorado in the Novice Division and 2nd in Wyoming. He has competed in Wyoming, Colorado, Oklahoma and Texas. Additionally, he and Scooter qualified first in Cole’s division the past two years for the World Finals held in Texas. Cole is already training horses and helping others to improve their horsemanship. He purchased three ponies to train in 2015, and has sold one finished pony to a delighted 5 year old girl who loves her calm and trusted new best friend. He also purchased a 2-year-old Palomino this past summer who is already showing promise under saddle to be great athlete in the sorting ring one day. 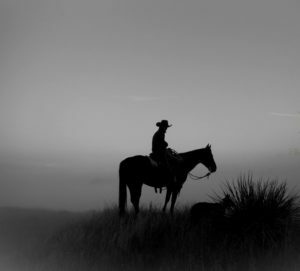 While horses have brought Cole and his family on an amazing journey in the past 8 years, one of the best parts of the adventure has been the opportunity to be involved in the “cowboy lifestyle”. Through traveling and competing, they have forged friendships that will last a lifetime. People who share simple family values, generous and loving spirits, and a passion for horsemanship and competition. All because of a 7-year-old cowboy who wanted to learn to ride a horse. Heather McWilliams © 2017.